Delhi, Mumbai, Udaipur, Kolkata, Sri Lanka and New York – Chef Sumit Batra packs all that’s he’s learned across the world and returns to his alma mater at the Oberoi to showcase a new Western menu at Le Jardin. Having worked under culinary gurus like James J. Kent and Daniel Humm who shaped Michelin star winning restaurant Nomad in New York, Chef Sumit attempts to balance simple, fresh produce with complex, new-age culinary technique. We were invited to try his signature tasting menu – a four course journey of interesting flavours and textures. When you’re going to debut, you make sure everyone remembers you! And what better way to shine, but to bring forth an ice filled platter with a beautiful Rock Oyster gleaming from its midst. 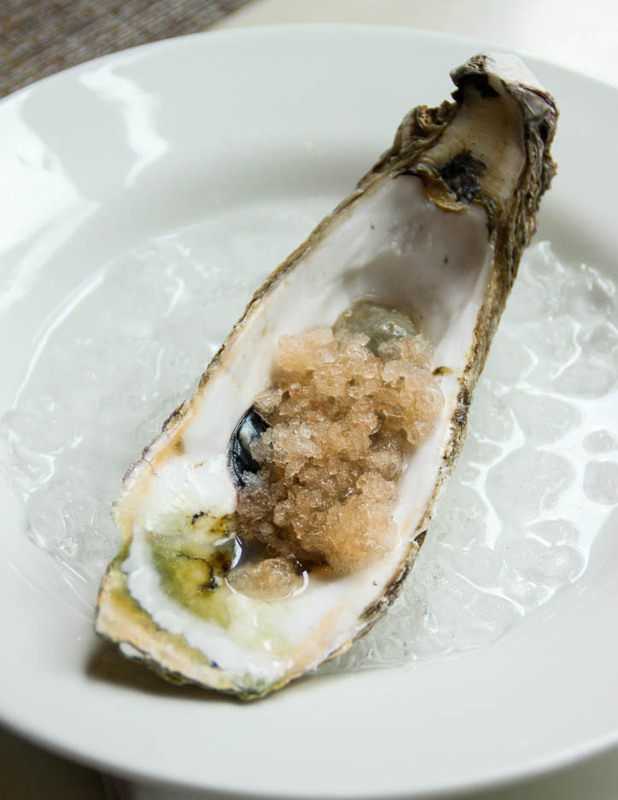 There’s not much you can or should do to a fresh oyster, so I really appreciated the fact that his ‘Nomad’ training prompted him to endow it with fresh Mignonette Snow. The cracked pepper, shallot and vinegar sauce is a traditional accompaniment to oysters, but seeing that ingeniously turned to snow ensures you’re wowed from the get go. 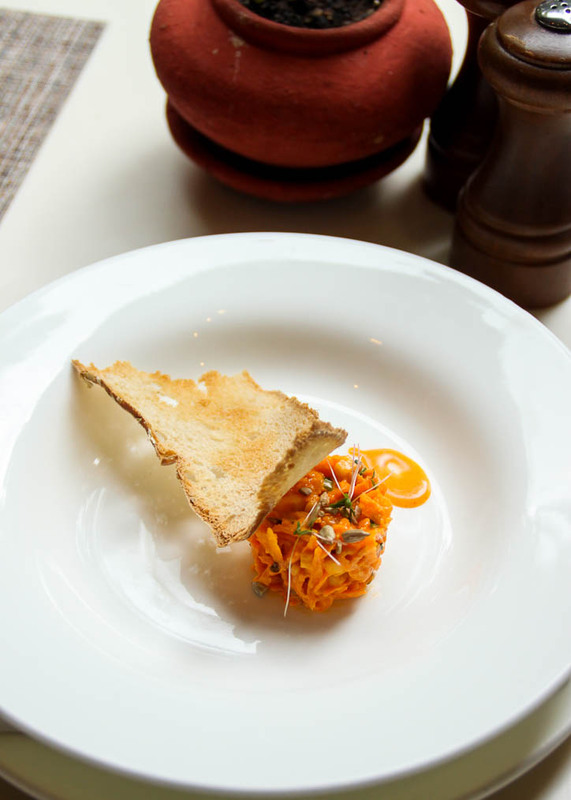 If Oysters are not really your thing, the Carrot tartare will offer a pleasant surprise. Spiralized carrots with carrot mayo (there IS such a thing), interspersed with sunflower seeds and a lovely multigrain crisp for crunch. Strangely, this reminded me of a carrot-dahi preparation my grandmom used to make, but I can’t see how those worlds’ collided. I see scallops on the menu and my resolve dissolves. (Yours’s would too if you saw the elegant plating :p ). 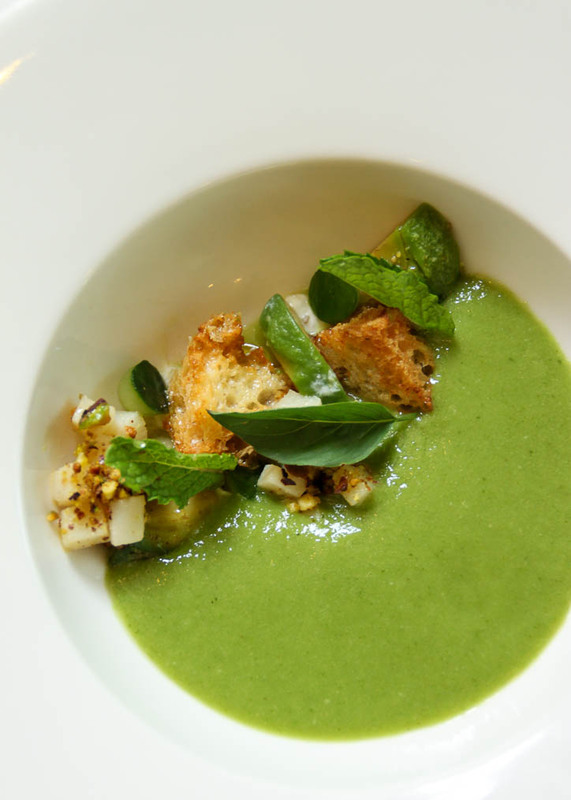 Fresh and sprightly mint and cucumber cubes, parmesan croutons and barely cooked scallops created a pretty crescent which was then filled in by a lovely Avocado Gazpacho. There was some ‘frost’ in this as well and it added to the fresh morning-dew feel of the soup. My favourite of the day. 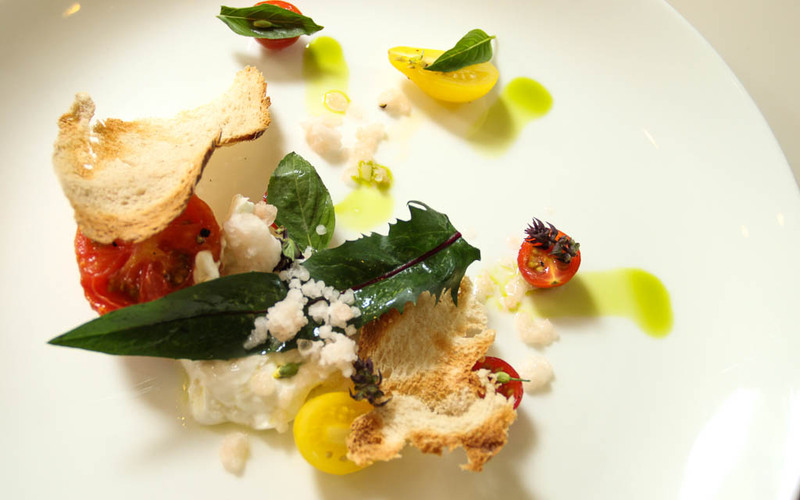 Tomato with Burrata is a classic and Chef Sumit owned this version with the perfect burrata, basil oil, varieties of tomatoes and some more frost. By now, whether he intended for it or not, I’m going to associate ‘frost’ as his signature style. There are a few things you pick up when you work in diverse restaurant spaces – an experimental mindset is one of them. 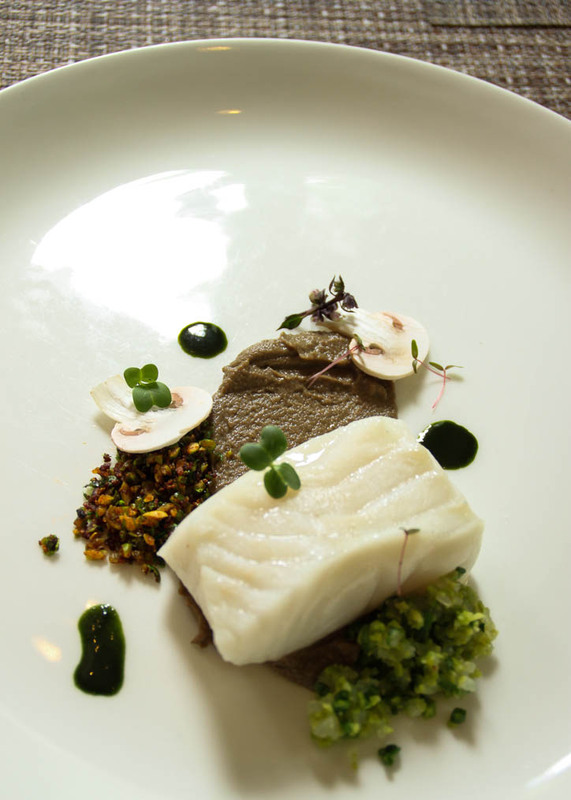 The main course of Chilean Seabass with Nori Mushroom puree, green peas and basil nage did not disappoint. Putting aside how beautifully the fish was cooked, what impressed me was the textures of mushroom chef played with – fresh, pureed and fried to a crisp. It definitely added a wonderful dimension to the seafood and seaweed combination – almost amplifying the taste of the sea. Our neighbours with the Lamb maincourse didn’t do too badly themselves. 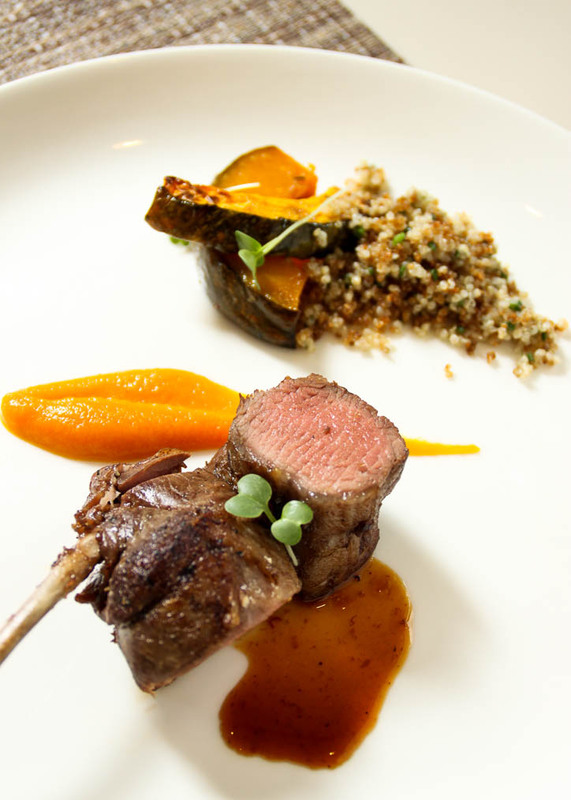 Pink, seared Lamb chops served with squash, carrot-miso puree, along with a crispy quinoa salad hit all the right notes. Dessert simply said ‘Textures Espresso-Affagato’ but what landed in front of me begged for multiple encores. 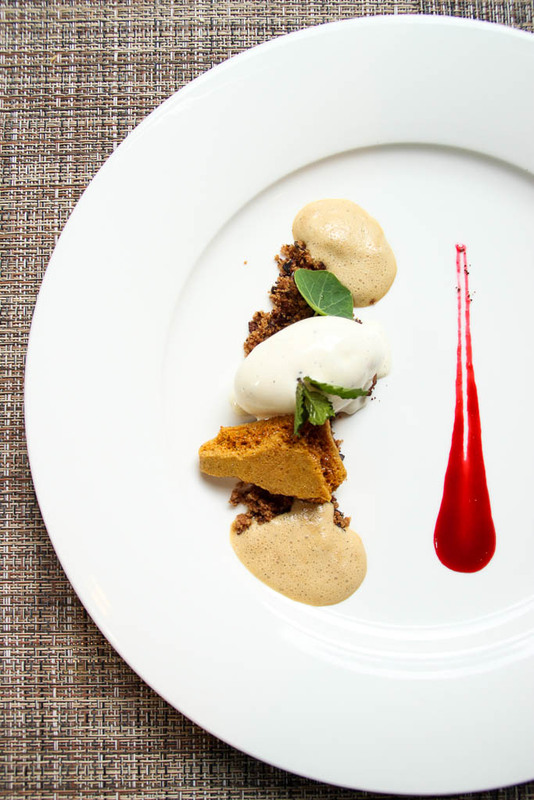 The beautiful Espresso Honeycomb was a class in itself and paired with the Vanilla bean ice cream, espresso foam and a raspberry coulis to add pizzaz – I couldn’t have asked for a better end to the meal. Well, in all reality I ate this dessert twice, so I did ask for a better end to the meal! Chef Sumit brings world class cooking techniques and beautiful food pairings to our tables. A bonus is that he also plates like a dream. But if I go back it will be because he knows how to respect good produce and enhance it just so – that itself has Nouvelle Cuisine written all over it! For reservations call +91 80 2558 5858. Cost : INR 3000++ for a meal for two.